Home Family Life: What's Best For Our Babies? What's Best For Our Babies? I recently posted a video to my YouTube channel showing what my 2 year old eats in a day and someone commented on the video stating, "slice grapes length ways just in case of choking". My initial reaction was, yes I know about that, I'm not stupid and my boy chews his food extremely well. But instead of giving some sarcastic comment back I decided to put the question out on Instagram and Facebook to see what others with toddlers did. I was interested to know if others still chopped their grapes, or like me didn't bother anymore. I used to be so frantic about chopping them, but now felt that he was a good enough eater for me not to worry. Well the majority of people said they did chop the grapes and a few said the recommendation was until at least 5 years old. Call me naive, but I had no idea that the recommendation was till 5 years old. I just thought it was until they had mastered eating properly. But in all honesty, I guess I hadn't really thought about it. So yes I probably will start chopping them up for him again. I guess in this situation, it's the what if that's a bit scary, he will probably be just fine, but there's one that isn't and you don't want that one to be your baby. And it really doesn't affect anything other than taking me a bit of extra time. But it got me thinking about other recommendations, are there some that we don't know about and do we keep to them all. I know I definitely don't, I moved my oldest into his own room at around 4 months old, even though the recommendation is to keep them with you until 6 months. But it seemed to work better for him, so I did it. I also didn't sterilise our bottles until 12 months, I think I stopped around 6 months. But again that was my lack of knowledge. I just figured at 6 months he was picking things up off the floor so there was no point sterilising any more. But I've since learnt that the reason we sterilise bottles till 12 months is because of the bacteria in the formula. At 12 months you usually move your little one onto cows milk, meaning there is no further need to sterilise. The list of recommendations goes on, don't swaddle, keep your babies cot away from radiators and windows, don't wean before 6 months, don't make bottles in advance, no coats/snow suits in car seats, don't co-sleep, no bumpers or soft toys in the cot, I think you get the picture. As a parent there's so much to know and learn about what's best for our babies. And it seems the recommendations keep changing, so it can be very confusing. Should we be sticking to these recommendations to the T? Or decide for ourselves what's best for our babies? I would say I'm of the opinion that we need to know what the advice is and then do what's best for our babies with their health and well being as our main priority. I was really interested to hear from other parents what their thoughts were on this. I asked if they'd learnt of a recommendation later that they hadn't previously known about, if they did something that went against the given advice and what their thoughts were of others not sticking to advice? Below are the experience and thoughts of a number of parents. Let me know what your thoughts are. Do you stick to the advice given, or are you flexible according to what you feel is best for your baby? Clare at Freddies Mummy UK "I didn't breast feed. I know it's outrageous! Honestly the grief I got hours after giving birth by the hospital staff was disgusting. My son is now 8 and is healthier than most children we know of his age. I know it works for most mothers but i just knew it wouldn't work for me. It certainly didn't and doesn't make me a bad mum! (Sorry it still makes my blood boil😂 )"
Jemma at Mayflower Blogs "There’s obviously a recommendation that babies sleep on their backs for as long as possible-but from an early age, our son wouldn’t sleep unless he was on his side. It meant many a sleepless night for me anyway, because I worried about him rolling onto his front, but he had lots of great nights sleep!" Victoria at The Growing Mum "My baby only slept on his front from when he was born so after many sleepless days and nights I just went it. You could see the look on the health professionals faces when I mentioned it so I just stopped saying unless asked. I would say follow your instinct and do what is safe. I've known people get breathing monitors for front sleepers. My baby could move his head from side to side quite early on so I wasn't too worried about the breathing." Kate at Kate On Thin Ice "My big thing was realising how recommendations change so quickly such as around weaning. Guidelines matter but mum's instinct is not the worst guide to things." Pete at Household Money Saving "I’m not surprised that people don’t always keep to recommendations. The law, legislation and advice seems to change on a monthly basis. As long as people aren’t putting their baby in danger, I don’t think it’s a particular problem." Kate at Ever After With Kids "I didn’t realise babies aren’t meant to have eggs until they are at least 12 months - both my babies have been knocking eggs back since they started weaning! Somebody mentioned it at playgroup and I overheard was just thinking ‘ooops!’"
Becky at The Mummy Adventure "I didn't know that breastfeeding was recommended until at least two years until recently.. I did know that sleeping on their backs as babies was recommended but after doing my own research I decided to allow my children to sleep on their tummies as they were more comfortable that way." Emma at Bubba Blue and Me "I think everything is done for safety, but it's so confusing because everything changes so frequently, e.g weaning age. I formula fed, and was lazy. My baby went from sleeping to screaming for milk with no warning. There was no way I could make up formula quick enough each time he wanted it. I used to make it up in the morning and leave it in the fridge, then just take the chill off it by sitting it on the aga. He was rarely ill, and is the same now, so it did him no harm. We also started baby led weaning early, at 5.1/2 months. The point with BLW is you go when they're showing signs. He was trying to grab food off plates, so we gave it a go given he'd been sitting up since 4 months old and had good control and coordination. Ok, so it was only 2 weeks off the guidelines at that time, but some people were surprised." Kati at How to Rock at Parenting "I bed shared in a normal bed (no side cot) for the first few months with both of mine. My health visitor said it's still not something she could recommend even though I followed all other safety guidelines. But it was the only way either of them would sleep and I figured a tired mum is even less safe!" Victoria at Lylia Rose "I started feeding my son earlier than 6 months, he was just so hungry and ready for food! My daughter on the other hand didn’t eat until 7 months, she just wouldn’t eat food at 6 months. I wish I’d not stressed about it all and realised they are just ‘guidelines’ not set in stone rules for every baby. Every baby is different." Kaiden at Kaiden Laverty (A Suffolk Dad) "At just a couple of weeks old, our little one refused to sleep on his back. He was just cry and cry, so we had no option but to put him on his front. We were so nervous and watched him like a hawk for quite some time! We also started weaning at around 3/4 months old as he was just ready, even the health visitor agreed so we started introducing little things." Lisa at Baby Not Included Blog "My daughter was an extremely bad sleeper and we ended up co-sleeping which the world and his wife wanted to give me their opinion on - mostly against 😁"
Lucy at Mrs H's Favourite Things "Our daughter was ill in hospital when she was first born and was looked after by the midwives a lot. She was frequently returned to me swaddled or the midwives asked to borrow my baby wipes when changing her nappy. Then before leaving hospital a midwife told me that I shouldn’t swaddle OR use baby wipes. And I thought ‘sod it’, if the midwives don’t follow their own recommendations then I’m not. I swaddled both my children and started using baby wipes from early on. It hasn’t done either of them any harm." Emma at Emma Reed "I’m co-sleeping with my second baby who was premature and that is a big no no. I’ve had the chat from the HV and the look from the GP but if my baby won’t sleep and just screams in his Moses basket what else am I meant to do? We all get to sleep this way, it’s lovely to have him so close after a rocky start and it makes breastfeeding him much easier." Jade at Raw Childhood "I've co-slept and room shared with all of mine. The amount of grief that I've had off midwives and health visitors is unreal but they quote out of date information to me so I quickly put them in their place and quote relevant up to date material. Little do they know that my background is in child development where I have a first class honours degree and worked with children for 10+ years. It shoots them down very quickly. Co-sleeping actually reduces the rate of SIDS if done safely and correctly. Safe to say that I opted out of the health visiting system altogether and we no longer have any health visitors coming into our house and telling me how to raise my own children." 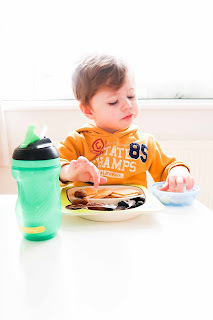 Georgina at Georgina Clarke Blog "I’ve co slept with both my babies, I’ve never used cotton wool (always baby wipes) and I introduced dummies and bottles with my breastfed baby from day one. I early weaned my first baby and that’s the only thing I regret and would consider not doing with my second. I think as long as you are making decisions knowing the information then it’s your decision. I often see people saying they stopped sterilising at 6 months due to their baby eating food, not realising that it’s due to the bacteria in the formula that is the reason you sterilise to one. Stuff like that worries me more as they didn’t realise and haven’t made an informed decision etc." Éva at Captain Bobcat "I didn’t realise I can eat Stilton because it’s not mouldy cheese till the end of my second pregnancy and that’s my favourite cheese 🙈"